This the first of a series of really fun reads that I read because it was recommended. Word of mouth is always the best advertisement and this time was no exception. Mary Faber is a street urchin in old London who knows how to read. She disguises herself as a boy, takes the name Jacky, and gets a job as ship’s boy on a merchant sailing ship. She carries off the disguise and learns how to sail and eventually earns the respect of the ship’s crew when they are attacked by pirates. After the fight, she’s nicknamed Bloody Jacky. From there, the story gets wonky in a good way. 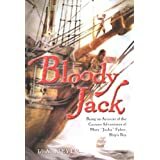 She ends up sailing through the sky across the ocean on a tree limb, fights the pirates a second time, and is rescued by her shipmates after they discover she’s a girl. The end of the story is her arrival at a girl’s school, complements of her share of the pirates’ loot and the captain’s wishes. I think the best way to describe this book is to say that it’s rollicking good fun. The best thing about it is that it’s the first of a series so I can continue to follow Jacky’s story as she changes from a street urchin to a lady to, or so I’ve been told, a ship’s captain. I look forward to those books. Of course it’s well edited and lacking the typos, etc,of some self-published books, being published by Harcourt, Inc.